Brian, who died in 2015 at the age of 80, joined the Lions Club of Shoreham, South Wick and Steyning in 1969, and has lived up to the Lions' motto 'We Serve' ever since. 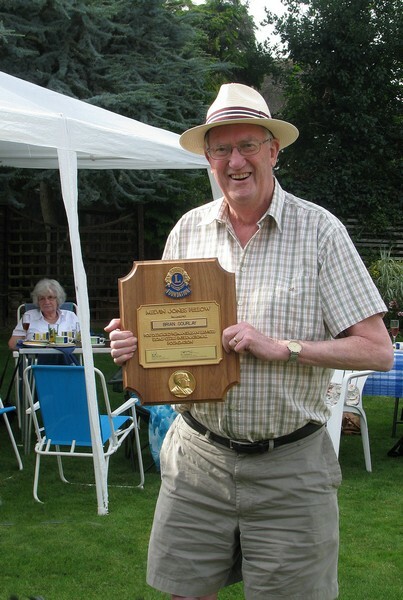 When he moved to Great Bookham in 1972 he founded the Leatherhead Lions Club which has been highly successful, with Brian as a leading member, ever since. With the club he organised the annual tour of Father Christmas, the annual 'It's a Knockout' contest for young adults with learning difficulties, stalls at the local summer fairs, especially the Hoopla game (we shall miss the raucous yell of "Hoooopla! "), the annual party for people living alone, and many other money-raising activities. These have provided thousands of pounds each year for local charities and the Lions' own activities, supporting the less fortunate in the area. As well as his work with the Leatherhead Lions Club, Brian was very active in the local Christmas Post fundraising scheme, the Charity Christmas Cards organisation, driving for Help Your Neighbour and as an Editor for Talking Newspaper. When he retired from the Sales Division of Rawlplug Ltd in 1997 he used a lifetime's interest in canal boats to help the John Pinkerton Canal Boat raise money for the Basingstoke Canal. He joined Mole Valley Probus Club and, concurrently with his Lions Club and other activities, was highly active on the committee, including a year as Chairman, and organised several club holidays.